A garden urn is a vase or container that typically has a narrower neck with a foot or pedestal. Urns come in a variety of materials and styles, ranging from Tuscan to French to Contemporary. On a recent shopping trip, I picked up some planters for our home. I found a couple outdoor french urns that will work great for the area outside the mudroom. These footed planters are made of cement and super heavy. Since we tend to get strong winds in our area due to the topography of our homes, we need urns with heft and weight. In the past, we had several planters blow over during storms, ruining flowers and causing a huge mess for me! 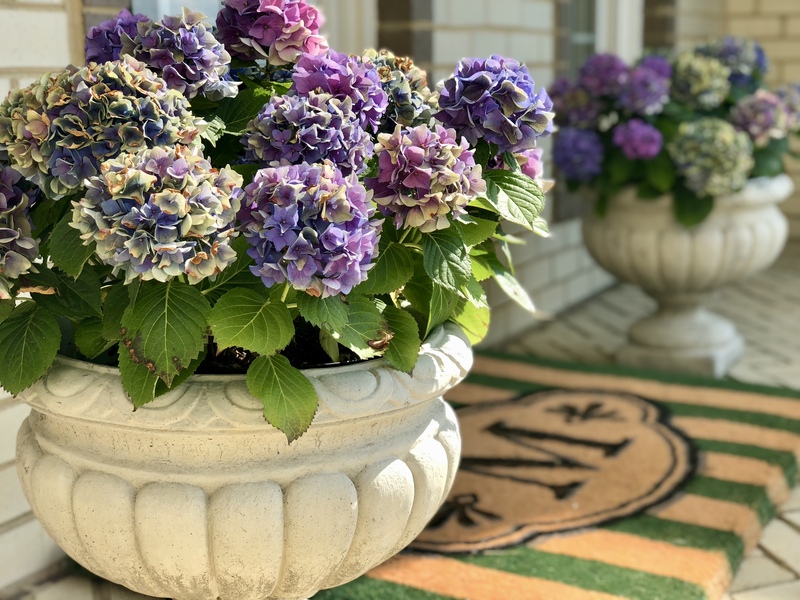 Our urns, similar HERE, HERE, and HERE are beautifully styled and fit in perfectly with our french country home. I placed a couple hydrangeas, found at Home Depot, into the urns. To make this project even easier, I left the flowers in the plastic containers they came in, no need to replant the hydrangeas into the urns. The area was also lacking a focal point, an outdoor mat. I found this beautiful coco rug at Frontgate (HERE) with green bold stripes. This outdoor mat is made of coconut-husk fiber and hand stenciled with fade-resistant dyes. It’s beautiful and works perfectly for our mudroom entrance, which we use several times a day to walk our puppy. Adding the rug makes such a difference to the space, bringing in color and texture, and it is super useful too! That’s a win win win in my book! I love the planters so much that I also purchased a few mini planters for the inside of our home. These mini urns HERE, HERE and HERE are a perfect addition to the mantel. Being able to use artificial or real flowers, depending on the season, makes these planters even more appealing. A wide variety of planters are also available at Target! For more decor inspiration, subscribe to Happy Haute Home and follow along on Pintrest HERE, and Twitter HERE and feel free to pin and tweet your favorite pics from Happy Haute Home. I think I will plant them in the ground for the winter, you’re right Lynn, they wouldn’t survive very well without being planted. Hugs!